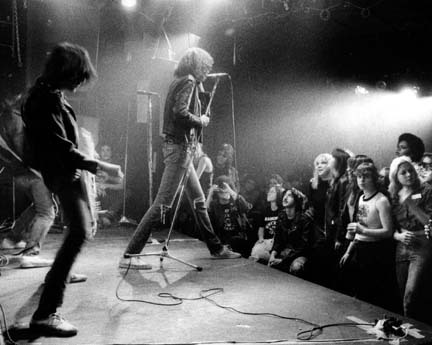 The Ramones Dee Dee (bass, vocals), Joey (vocals), Johnny (guitar), Tommy (drums, later replaced by Marky) were the American punk band, an endless wellspring of noise, energy, attitude, humor and (sometimes forgotten) great songs, who helped reinvent rock ‘n’ roll when it needed it most in the mid-'70s. Working for indie Sire Records in the mid-'70s, producer/talent scout Craig Leon became involved with the percolating New York underground music scene. One summer night in 1975 he went to CBGB’s and saw two bands, the Talking Heads and the Ramones. “I went to that show and there were literally four people in the audience besides me, but the bands were phenomenal,” Leon said. “A lot of people didn’t even think the Ramones could make a record. There were weeks of preproduction on a very basic level: like when the songs started and when they ended. Their early sets were one long song until they ran out of steam or fought. You could see it as a performance art-type thing, where you had a 17-minute concise capsule of everything you ever knew about rock ‘n’ roll, or you could see it as 22 little songs,” he said. They went for the songs. Recorded in 1979, the album made explicit the connection between early-'60s pop-rock and the punk band’s psyche, and holds up as both a Ramones and a Spector classic — Spector’s idiosyncrasies never overwhelm the roar of “Chinese Rock” or “Rock ‘N’ Roll High School,” and the Spectorish “Do You Remember Rock ‘N’ Roll Radio” rollicks with just the right retro touches. The band’s remake of the Ronette’s “Baby I Love You” is as touching as it is fun, and shed a whole new light on singer Joey Ramone (who died in 2002 after a long bout with cancer — I sure do miss that guy).